After MyTeksi announced they are giving away RM30 worth of travel voucher in Kuching during Gawai Dayak, I decided to try them out. If you do not know what is MyTeksi, its basically an app on your smartphone and tablet which allows you to book or hire a taxi in Malaysia, with Kuching it’s latest addition of coverage. Others are the Klang Valey, Penang and Johor Bharu, if I am not mistaken. MyTeksi has been doing a beta run in Kuching for quite sometime, and their recent official launch signaled they were doing very well in the city. Booking a taxi in Kuching was easy because it relied a lot on GPS, which means that you do not have to verbally call the taxi driver and give directions to him. He can just check where you did the booking, or where did you place your start point is, and head there to pick you up. The problem that arouse however was that there are moments the GPS couldn’t locate the street of place you are in despite you typing it a hundred times. My efforts showed that all I could find were locations far away from where I was. 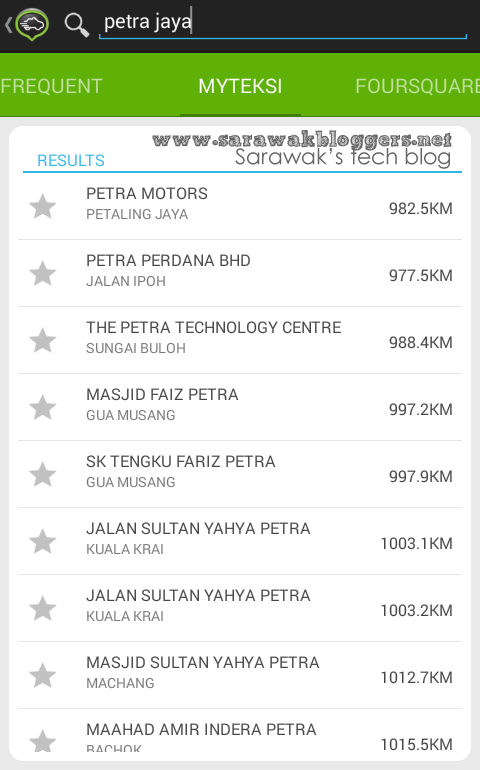 Looked for Petra Jaya in the GPS and had a lot of places far far away located. None in Kuching. But there’s an answer to that. Tap on the ‘Foursquare tabs’ and look for your location using Foursquares. 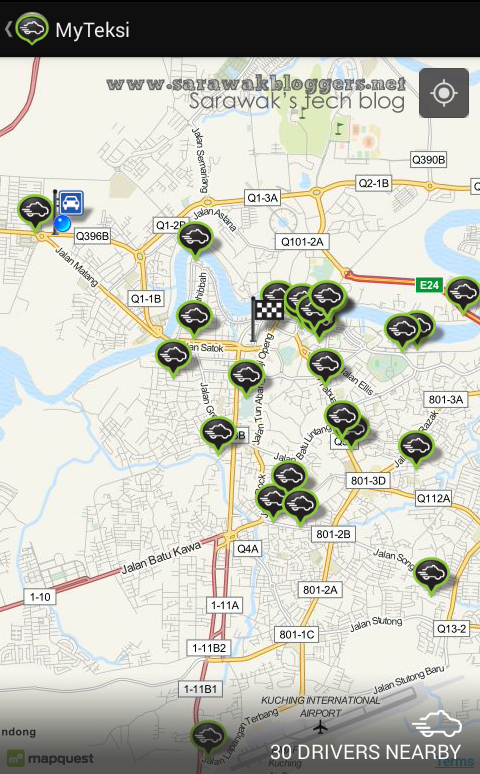 It’s more accurate and your location in Kuching is readily added by hardworking Foursquare users. Interestingly, when you book your taxi, a few taxis nearby (In Petra Jaya) or far away (as in Samarahan) would be notified about your request to hire a taxi. As far as we know, you can’t choose who takes you, but the drivers as we understand, has to be the fastest to pick up your booking to be able to serve you. In easy terms, the drivers responding to your booking would be based on first come first to serve basis. Taxi locations shown on screen. You can’t select them, they select you. There are good and bad things about this. For our trip, a taxi driver in Samarahan was the first to pick up the request, and charged us beyond RM50 for a ride to the airport. This was double the rate offered by a normal call in taxi, and so we canceled the request. Our second try saw a taxi driver from Semeba picking it up, and he charged us only RM34, which means a mere RM4 for us after deducting the RM30 discount offered by MyTeksi. Cancelled one booking due to high charges. The second one was better priced. This to us proves one thing, which is the rates you pay for your ride depend highly on the location of your taxi. The further your taxi is from your location, the higher you are expected to pay. Now, we tried to use the advance booking feature, as we had a flight to catch at 5:30AM in the morning. Because this is our first time using the apps, we decided to book the taxi at 4:00AM, just in case the taxi never showed up. One thing which we felt was quite a hassle was the need to call the taxi for the booking we made. The call as said by the app, was to ‘confirm your booking’. We find this a little funny since we felt bookings through the app should be suffice. Well, the taxi driver did show up at 3:50AM, and he was pretty nice to us during the whole journey despite the early pick-up. According to the driver, the apps has worked well for him although he realized that most his customers are of the teenage group. At the end of the ride, he helped us take our bags out of his Innova taxi, and accepted the RM4 taxi fee (after deducting the voucher of RM30). -GPS location needs to be improved. Had to use foursquare. 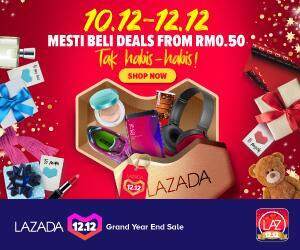 Have you used MyTeksi? How about your experience? Do share in the comment section below. Next articleXiaomi Mi 3 on sale at RM769 tomorrow!